If we have any more games like Sunday’s game I am sure to have a full head of gray hair by the end of the season. 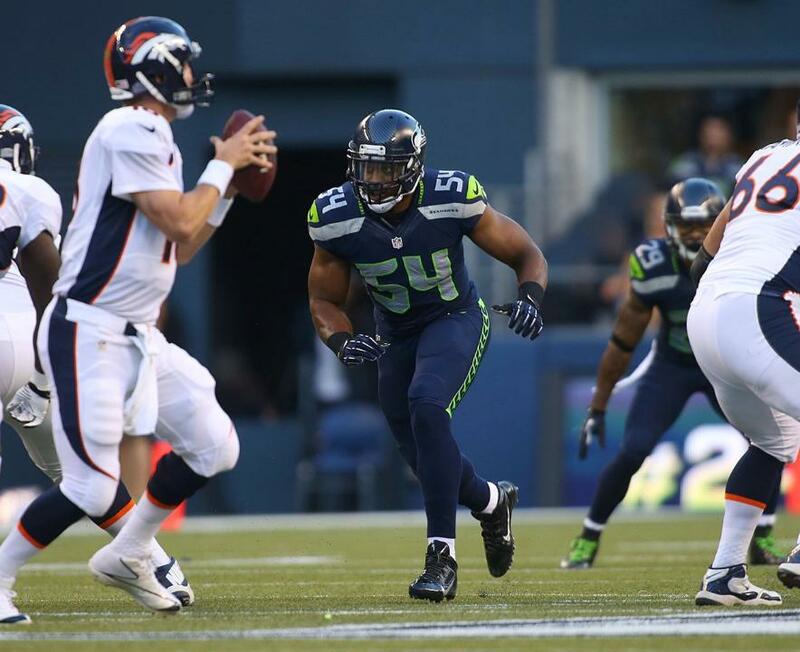 In a game I felt the Seahawks needed to win, they displayed shades of many different games over the past couple of years en route to a wild 26-20 overtime win over the Denver Broncos. With the win the Seahawks improve to 2-1 on the season and currently hold sole possession of 2nd place in the NFC West. The Broncos now also sit at 2-1 and are tied with the San Diego Chargers for first place in the AFC West. As even as this game may have been on the stat sheet and even though the Seahawks won, they struggled in some areas which could definitely be improved before we play our next game in two weeks. Here are my takeaways from Sunday. Thoughts on Russell Wilson: There were parts of Russell Wilson’s game I liked and other parts that I thought were not very normal. I said in my Broncos preview that Wilson was going to face two different Denver cornerbacks from what he saw in the Super Bowl and he took advantage of the new matchups. Specifically, Wilson hit wide receiver Ricardo Lockette for a 39-yard touchdown with 3:05 left in the second quarter over cornerback Aqib Talib. Wilson also showed a side of his game that had not been seen before as he caught a 17-yard pass from Jermaine Kearse after Wilson lateraled to Kearse. Opening the playbook up like that shows a versatile side of Wilson’s game that I think the Seahawks could use to their advantage in select situations throughout the rest of the season. There was one facet of Wilson’s game that I did not particularly like. Wilson has been labeled a “game manager” in the past by several members of the media and today was the first time I felt like he played to that title. Until overtime, Wilson seemed to stay inside the pocket to try to wait for his receivers to open up rather than scramble for positive yardage if a play is blown. In addition, on the final two Seahawks drives of regulation with the Seahawks holding a 17-12 lead it felt as though the tempo and the play calling set the Seahawks up to chew as much clock as possible rather than trying to score more points for insurance. It may have been by design but I hope that Wilson gets back to what I consider to be his “normal self” because Wilson’s game did not seem that normal to me on Sunday. First Half Defense: The Seahawks defense held Peyton Manning and the Denver offense to only 3 points in the first half. A lot of the credit goes to the run defense. 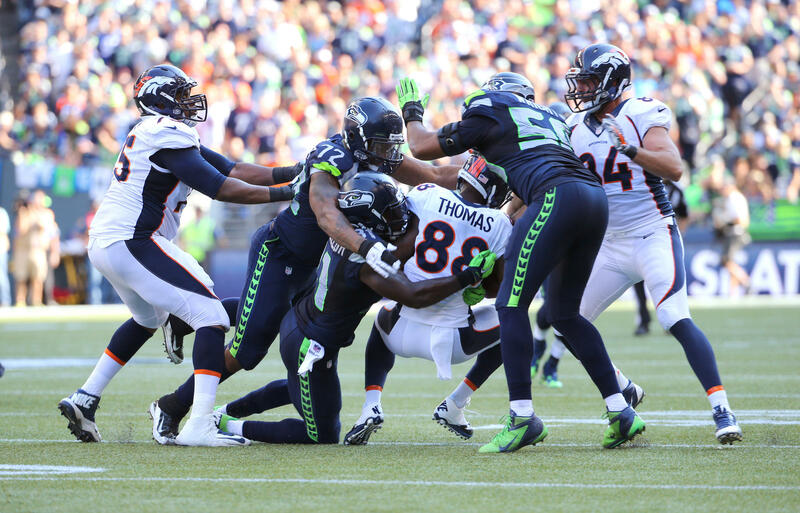 The Seahawks run defense which has struggled at times so far this season held Broncos running back Montee Ball to 19 yards on 10 carries in the first half, including a fumble recovered by K.J. Wright on the Broncos first offensive play from scrimmage. In the passing game the Seahawks and the Legion of Boom held Manning to 87 first half yards through the air as he completed 11 of his 17 first half throws. More importantly the defense was able to get off the field and rest as the Broncos were only able to convert 3 of their 7 third down chances. This is the kind of defense that the Seahawks should have been able to play consistently throughout the game and it is a shame that the end of the game overshadowed the dominant performance of the Seattle defense through the first 30 minutes of play. Manning’s Game Management Questionable: If Peyton Manning had been able to move the Broncos offense in the first three quarters as well as he did on Denver’s two fourth quarter touchdown drives, we would be talking about a totally different outcome. In those two touchdown drives the Broncos sped down the field in a combined 2:23, running 11 plays for 99 total yards. In these situations Manning used no huddle which is something I speculated about before the game. I thought it may have been a good idea for Denver to use a no-huddle offense sporadically throughout the game to try to take the 12th Man out of the game. Instead Manning managed the game similar to how Russell Wilson managed the game and it may have ultimately cost Denver the game. Shades of Atlanta: After Steven Hauschka kicked a field goal to give the Seahawks a 20-12 lead the Broncos had only 0:59 to go the length of the field to score a touchdown and convert a two-point conversion to tie the game. They did just that and from my seat in section 340 it screamed a reminder of the Seahawks collapse in the 2012 playoffs to the Atlanta Falcons. After being held to only one touchdown the Broncos offense seemed to simply flip a switch and suddenly they could go through even the toughest defense like a hot knife through butter. 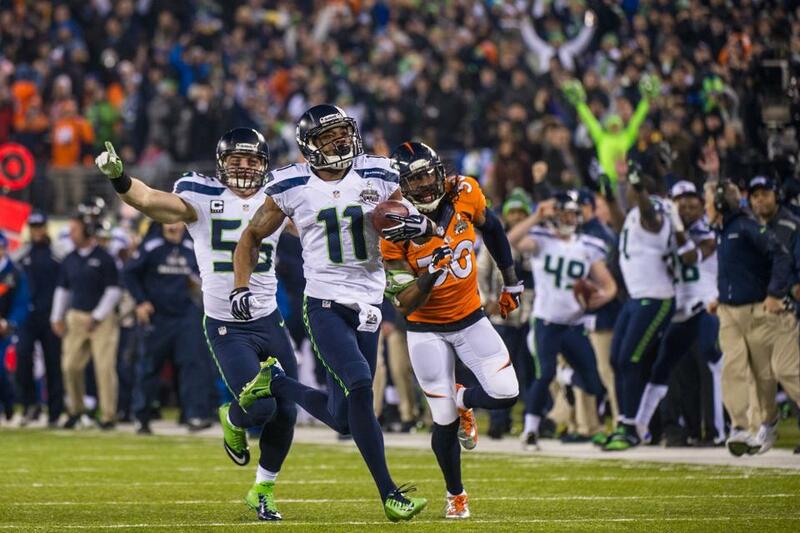 That Denver drive to tie the game this week combined with the ineffectiveness to stop San Diego on third down last week scares me into believing that perhaps this 2014 Seahawks team may play more like the 11-5 Seahawks of 2012 rather than the Super Bowl champion Seahawks of 2013. Shades of Chicago and Houston: As disappointing as it was to see the Seahawks defense let Denver tie the game at the end of regulation, the resiliency of the Seattle offense in overtime had me breathing a heavy sigh of relief. The ability of Russell Wilson to lead an 80-yard drive in overtime to win the game had me thinking back to past overtime wins over the Chicago Bears in 2012 and the Houston Texans in 2013. 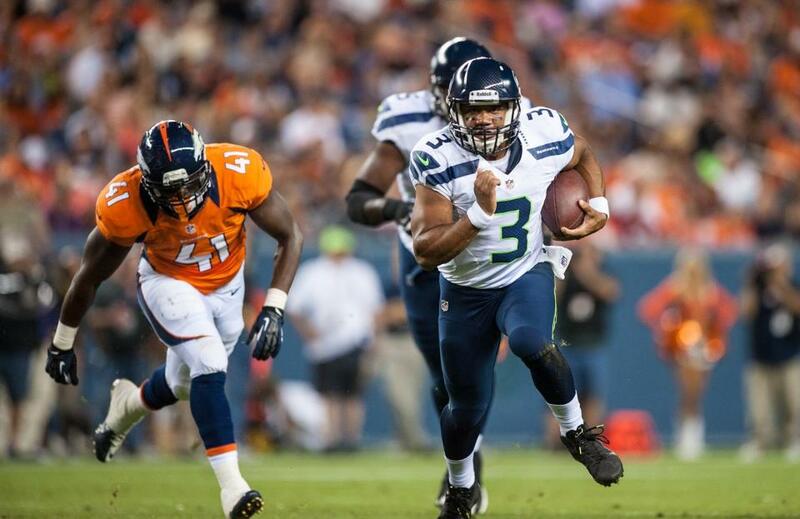 In both of those games Wilson was forced to use his arm and his legs to move the ball into scoring position and that is exactly what he did again on Sunday. After playing rather conservative for the first four quarters Wilson was more willing to take the game into his own hands in overtime. He proved this by rushing 4 times for 22 yards. The final drive of the game showed a perfect combination of run and pass as Wilson added 4 completions for 35 passing yards. 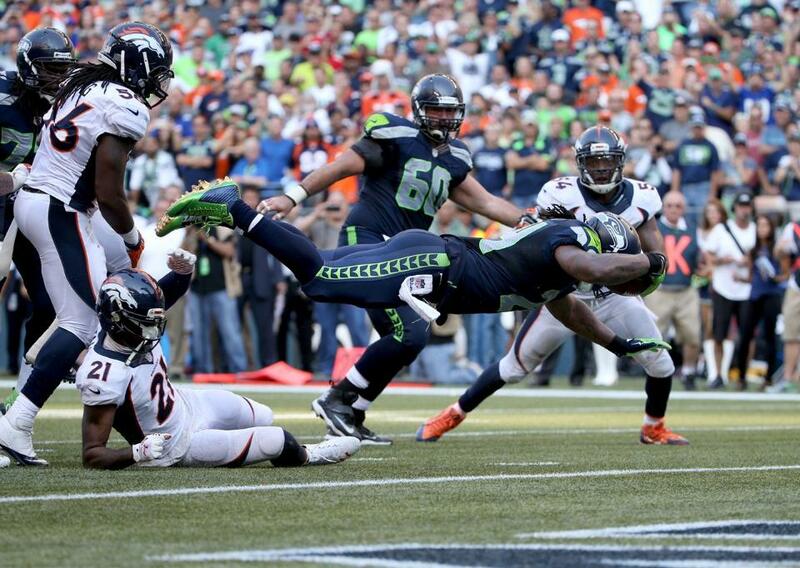 Under Russell Wilson the Seahawks now have a 4-0 record in overtime games. Thoughts on Denver: It is tough to come into a hostile environment and play good consistent football. Although the Broncos struggled at times they are still a strong contender to challenge for another AFC Championship. Although the Broncos are not scoring points at the record-setting pace that they did last season, they need to be more effective finishing drives. All three of their games have been decided by one score, something that is uncommon especially when compared to their average win margin of 16 points a season ago. The Broncos defense has shown dramatic improvement and I believe they are very close to being categorized in the same level as some of the dominant defenses in the NFC. Random Thoughts: It was a hot one today. Off the top of my head I cannot remember a past game where it has been that warm throughout the entire game. Good thing is by the time our next home game rolls around in 3 weeks it should be in the high 50’s or low 60’s or as I like to call it, comfortable… All blue uniforms for the Seahawks and all white uniforms for Broncos this week just as I predicted… Nate Robinson raised the 12th Man flag this week. I always like it when the Seahawks bring in a celebrity with ties to the opposing team to raise the flag. I am sure Denver Nuggets fans were thrilled to see their point guard representing his hometown team… At halftime the Seahawks introduced an updated look of our mascot, Blitz, as well as Blitz’s new sidekick/friend named Boom. Personally I don’t understand the concept of changing the look of a mascot but the new Blitz looks more like our logo which I guess is cool… Here is a funny story that had me thinking “true Broncos fan from Denver.” I was enjoying a Bud Light at the Brougham Beer Hall before heading up to my seat and a Broncos fan wearing an orange Peyton Manning jersey went up to the bartender and asked if they had Coors Light (for the small handful of people who somehow do not know, Coors is a Colorado brew). When the bartender said no and all they had as far as light beer goes was Bud Light, he politely declined and walked away. I thought that was pretty funny…. To my surprise there was not nearly as much “we won the Super Bowl” banter hurled toward the Broncos fans in attendance… That was really cool to see that DeShawn Shead proposed to his girlfriend following the game. Congrats 35!… Happy Birthday to Doug Baldwin as well! As early as our bye week comes this year, I think it comes at a really good time. Let’s rest up, reload, and get ready for a big primetime road game in two weeks. With the bye week coming up my next game preview will come in about a week and a half before we take on the Washington Redskins in week 5. I am traveling to Washington D.C. for the game and I have not decided whether or not to take my computer with me. If I do, look for my preview the day before the game. If not, my preview will be published a few days early. Be on the lookout. If any big news breaks from now until then I will hop back on to give my take. Thanks for reading and go Seahawks!